Subscribe to our mailing-list to receive printed tour booklet. Depart Any Day - Save 25%. Where two tours directly follow on another, a 10% discount may be available on the land content cost of the second tour if booked concurrently. 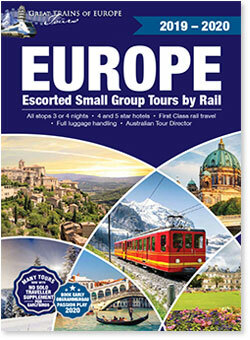 Learn what makes Great Trains of Europe Tours great. Enjoy the world-famous Christmas Markets and Classical Music tradition of Germany, Austria and the Czech Republic. One performance - orchestral, opera or ballet - included at each stop. Visit Munich, Nuremberg, Salzburg, Vienna, Budapest, Dresden, Leipzig, Berlin. Departs 30 November 2019, 21 days $AUD 11,900 per person twin-share. From the Great Wall of China to the Walls of Constantinople. Optional 8 days / 7 nights post-tour add-on: Turkey: Istanbul, Troy & Gallipoli. A pilgrimage in the Footsteps for the Knights Hospitaller, to celebrate 50 years of the OSJ in Australia. Israel, Rhodes, Malta, Rome. Or take as a 15 day tour option (excluding Israel). Great Trains and Luxury Hotels through Eastern Europe’s Historic Capitals. Departs 21 August 2019, $AU15,950 per person twin-share. Great Trains of Europe Tours have been accompanying pilgrims to the Passion Play since 1990, and we are delighted – again in 2020 – to offer three European tours which include the Passion Play. Departures: Amsterdam May 5th, Paris September 3rd, and Zurich September 25th. Swiss Mountain Rails with The Oberammergau Passion Play › Limited Seats Remaining. Oberammergau Passion Play with ‘Off the Beaten Track’ › SOLD OUT! Wait list only. Oberammergau Passion Play with Italy’s Cultural Capitals & Swiss Alps SOLD OUT! Wait list only. Bulbfields, Chateaux Gardens of France, English Villages & Gardens, including the Chelsea Flower Show. Springtime Blossoms & Bulbs: Departs Amsterdam 5 May, 20 days $AU12,950 per person twin-share. SOLD OUT! Wait list only. A pilgrimage in the Footsteps for the Knights Hospitaller, to celebrate 50 years of the OSJ in Australia. Israel, Rhodes, Malta, Rome. May/June 2019. Take as 21 day tour. Or take as a 15 day tour option (excluding Israel). Private train & First Class hotels. All meals & sightseeing, Australian Tour Director, local guides. Enjoy the world-famous Christmas Markets and Classical Music tradition of Germany and the Czech Republic. One performance - orchestral, opera or ballet - is included at each stop. Visit Munich, Nuremberg, Salzburg, Vienna, Budapest, Dresden, Leipzig, Berlin. Eastern European Capitals together with Provincial Diversions: off the Beaten Path. Prices are in Australian Dollars (AUD) and are subject to change.